The Power business is likely the most meaningful problem at GE today. An outsider CEO might have both identified this and be willing to take the likely radical action necessary to fix it. Not only is Mr. Flannery an insider, but he is the one credited with the deal that likely doubled down in the wrong business, so we are concerned that it will not be the focus it needs to be. GE is now equipped to be the industry leader in a business that is going away – much more quickly in the West than in the developing world – but declining. The days of the large power plant, coal, nuclear and natural gas are numbered! Ok, so it’s a large number of days – but advances in renewables, storage and smaller efficient natural gas fired power plants and engines suggest that distributed power is the way forward. Our colleagues, Hugh Wynne and Eric Selmon have a strong preference for the local regulated utilities over the IPP’s partly because of this expected trend. Centrica in the UK sold its last remaining stand-alone power facilities this quarter and is building a huge battery storage facility in the UK to handle small plant interruption and peak demand. While there will remain significant demand for large scale power facilities it will likely be in the developing World – regions and countries where GE operates well and has done for years, such as Bangladesh. 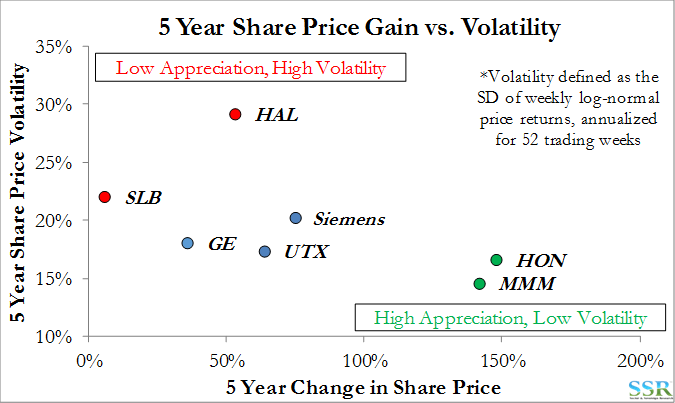 But..
We would expect the overall global level of investment to slow – so GE has to win share to maintain revenue – i.e. reduce price and margin, as no-one else is going to give up! The geopolitical risk of the business will go up as more and more new business is focused outside the developed world. The right thing to do is probably to write off possibly as much as the Alstom acquisition, sooner rather than later, and refocus the business in the areas where there remains more broad growth – i.e. in the smaller more efficient gas powered plants – possibly shrink to grow. We suspect that this will be a very tough pill for Mr. Flannery to swallow and so it is more likely that it will not be a focus and the business will continue to disappoint. Other necessary moves in our view: remove GE Capital – with loan/finance books going back the P&Ls of the businesses they support; spin out of Energy and the sale or spin of healthcare. We think the stock has downside in any scenario except the one above coupled with complete honesty about real earnings – even with this the stock may still fall further. In short, the more time we spend on GE the more negative we become and the less likely we think the new CEO is to set off the appropriately sized grenade in the middle of the company when he reports back to investors in November. The list of things that need to be done is long, and given the likelihood that any earnings reset will be significant, everything on the list likely needs to be addressed to prevent another leg down in the stock. First, we think November is too long and have said this since his initial comments in August. What we have is a “data free” vacuum, and the result is that all, ourselves included, fill that vacuum with more analysis, more (probably circular) discussions with clients all of which pushes you in a more negative direction than positive. GE has underperformed the S&P500 by 7.5% since August 1st, closing on Friday below $24 per share. The company has now underperformed the S&P by 36% year to date. Surprising on the upside on timing, by announcing the new plan with or before Q3 earnings would probably shine a better light on Mr. Flannery, suggesting urgency rather than complacency. 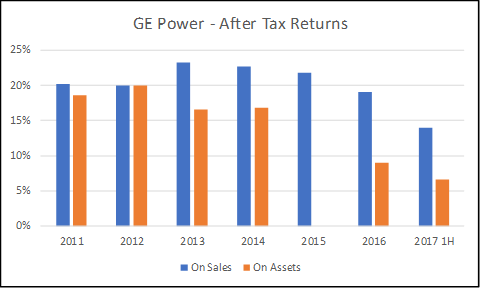 Leave it to late and then underwhelm and the stock could drop materially as disappointment would come at the time of the year when investors look at “tax loss” selling – GE would certainly be a lead candidate. Second, we think it is time to say goodbye to GE Capital and all of the accounting vagaries that it brings with it – the time for opaqueness is over and to regain investor confidence the financial results need to be clear, however disappointing they may be. The pieces of GE capital that relate to funding of projects within each business should be returned to each business – that way a proper accounting of the profitability of each business can be made, including any financing deals that have been made to help win business. The remained needs to be either written off – sold (or given away – or someone needs to be paid to take it). As we have indicated in prior research, GE Baker Hughes should be spin off – probably not immediately as the company still has a synergy opportunity which should accrue to GE shareholders before a spin; although with a spin today, GE holders would still have access to those synergies should they continue to hold the stock. The risk, both upside and downside of keeping the business is the oil price. If oil falls meaningfully, no level of synergy is going to help the share price. At a minimum, we believe that Mr. Flannery should announce the intent to spin off this business when he announces the new strategy. The other obvious spin is Healthcare and we would like to see an exit strategy for this discussed at the same time as everything else. All of the above, plus the appropriate write-downs in the power business might save Mr. Flannery and may limit the downside in the share price when expected earnings and cash flows for 2017 and 2018 are reset. The odds of survival are even higher if the reset comes with an aggressive cost reduction target. We see a surviving GE (for now) with most of the “moving” “rotating” businesses still in the portfolio – engines (aircraft and other), wind turbines, power, other electrical, locomotives etc. No energy, no healthcare and no capital. This is still a very large business and one which is not making adequate returns and is seeing a business migration accelerating away from the developed markets to the developing ones. GE has invested/acquired looking in the rear-view mirror for the better part of two decades in our view – buying at the wrong time in the cycle or the evolution of a business and selling at the wrong time also. Simplifying the company as outlined above or with some approximation to what is outlined above. While we would like to include all sorts of charts and data to support our views, the opaqueness of GE’s reporting would require too much “guessing” rather than robust analysis, hence this is more of an editorial than a research report. It does reflect an amalgam of views from those that own the stock and those that refuse to. 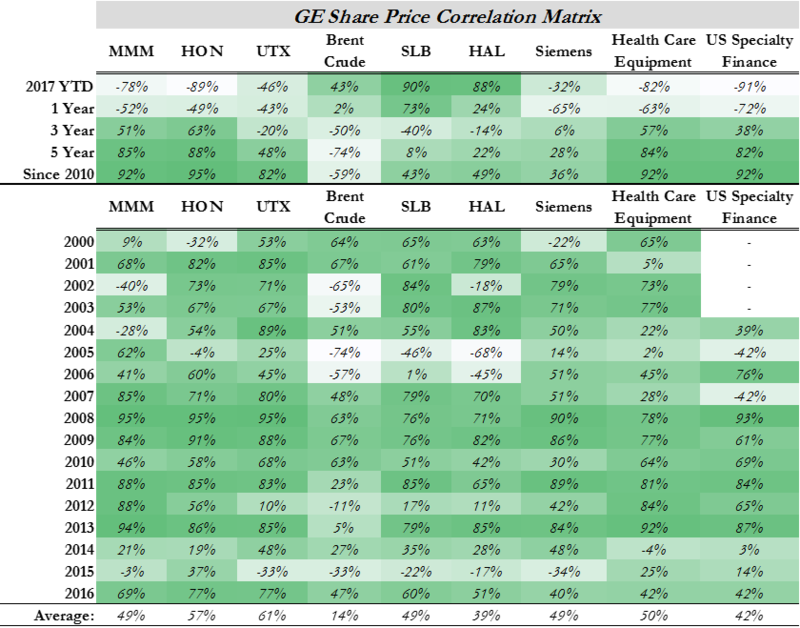 GE segment data does not look that bad – with the highlighted concerns around power – Exhibits 2 and 3, but these numbers exclude any hits to margin that are hidden in the losses that GE Capital is making that relate directly back to these businesses – consequently we do not think the analysis below, while illustrative, is that meaningful, because some of the margins are likely overstated. 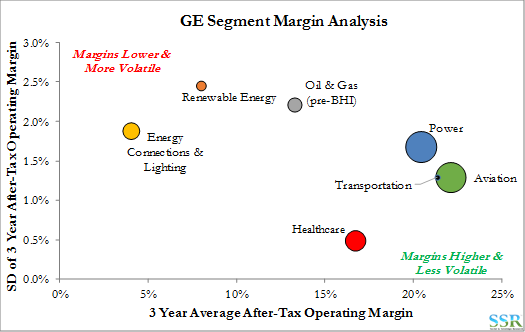 We often hear the line that GE margins are best in class so how much cost can be cut – the opportunity rests on whether we are comparing apples to apples on the margin front, and also on whether GE should be compared to others or whether margins should be better anyway because of the sector leadership and scale. This analysis is repeated from work we published before the CEO change. GE needs to escape from the oil correlation that has attached itself to the company since the Baker Hughes deal was announced. 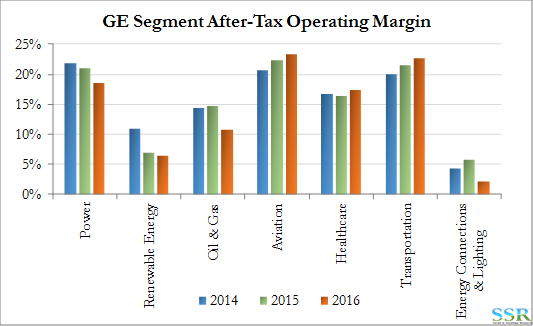 Mr. Flannery can do the best job in the world with the rest of GE, surprising on the upside at all points, but if oil goes to $25 the stock will underperform as long as GE holds a large stake in BHGE.